I-LOFAR from a balloon. Image by Alison Delaney, Birr Castle, September 2018. 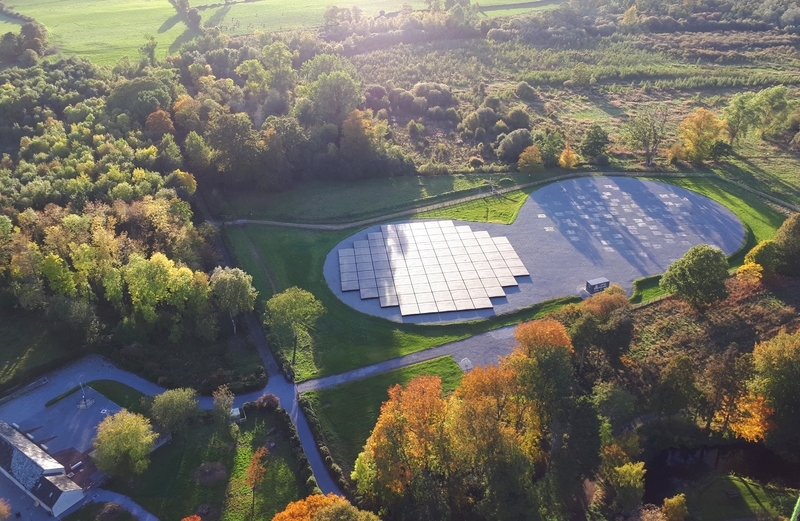 The Irish LOFAR radio telescope at Birr Castle which is being used by scientists to monitor solar storms and their effects on Earth. Credit: Peter Gallagher (TCD). Prof. Peter Gallagher, head of I-LOFAR, Minister Halligan, Ruth Freeman (SFI) and Richard Moat (eir CEO) at the switch-on of I-LOFAR. This mosaic highlights some of the prominent sources from the full image. The resolution of this image is 5 arcseconds. The multi-wavelength jet for 3C 273 spanning 10". The left panel shows the 1.6 GHz radio emission as detected by MERLIN, the centre image shows the optical emission using HST, and on the right is the X-ray emission from Chandra. The jet is emitted from the core of the AGN and the intensity varies across the electromagnetic spectrum. The bright knots and areas of weak emission are evidence of a structured morphology. Credit: Marshall et al. (2001). The €150 million International LOFAR Telescope network. Ireland has now committed to joining this network for 5 years.